Community based testing event. Image from presentation slides by Maya Petersen. 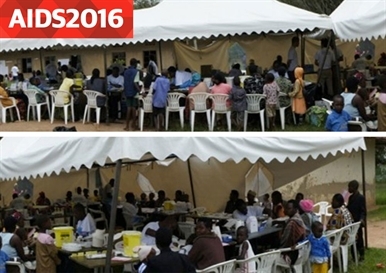 A large study that embeds 'test and treat' for HIV within a larger multi-disease prevention campaign in rural Kenya and Uganda has achieved 82% viral suppression after two years, and already exceeded UNAIDS targets for viral suppression after one year of activity, investigators from the SEARCH study reported today at the 21st International AIDS Conference (AIDS 2016) in Durban, South Africa. The UNAIDS 90-90-90 targets (90% of people diagnosed with HIV, 90% of diagnosed people on treatment and 90% of treated people virally suppressed) equate to viral suppression in the entire population of people living with HIV of 73%. The SEARCH study achieved viral suppression of 77% after its first year of activity, and 82% after its second year, Dr Maya Petersen of University of California Berkeley School of Public Health reported. The SEARCH study was designed to test whether offering HIV testing within a larger community screening programme for non-communicable diseases such as diabetes would increase demand for testing, whether a streamlined linkage to care model improves treatment initiation, and whether the sequence of enhanced linkage and person-centred treatment improves retention and viral suppression. The primary outcome being measured in the study is whether the entire package leads to a reduction in HIV infections in the communities where it is offered. A multi-disease prevention campaign that includes testing for HIV, diabetes and hypertension, with a two-week health fair and household testing in each community. (Read more about the SEARCH study interventions here). Dr Maya Petersen presented interim results of the study, looking at the proportions of people on treatment and virally suppressed after one and two years. Data were collected at baseline and after twelve and 24 months of follow-up. Participants were tested for HIV and viral load was checked for those found to have the infection. ART consisted of a standardised regimen of efavirenz with tenofovir and emtricitabine or lamivudine. The intervention adopted a patient-centred approach to care. Viral load counselling was offered to all patients. At baseline and again after one and two years, the investigators estimated the proportion of all people with HIV who were diagnosed; the proportion of diagnosed people receiving ART; and the percentage of people treated with ART with viral suppression (defined as a viral load below 500 copies/ml). The investigators also calculated the proportion of all people living with HIV with virological suppression. The baseline study population consisted of approximately 78,000 individuals with stable accommodation. The majority (55%) were women, 53% were farmers and one-third were aged 24 years and under. Baseline HIV prevalence was 10%, but this differed by region (West Uganda: 6%; East Uganda: 3%; Kenya: 20%). At baseline, 70% of people with HIV had been previously diagnosed, 80% had ever taken ART and 86% of those people treated with ART were virally suppressed. Overall, 45% of all people with HIV had a viral load below 500 copies/ml. By the end of year 1, 96% of people with HIV had been diagnosed, 91% had taken ART and 89% were virally suppressed. By the end of year 2, the intervention exceeded UNAIDS 90-90-90 targets. By this time, 97% of people with HIV were diagnosed; 94% had received ART and 90% were virally suppressed. In addition, 82% of all people with HIV had a viral load below 500 copies/ml. The intervention was also successful at reaching populations with traditionally sub-optimal levels of engagement in care: 97% of men and 97% of mobile populations had been tested for HIV at least once by month 24. Whereas men were much less likely to know their HIV status at baseline, the gender gap in knowledge of HIV status was virtually eliminated by the end of year 2 and equalised at the end of year 2. A gap in HIV diagnosis, treatment initiation and viral suppression persisted throughout the follow-up period between younger people aged 15 to 24 and older people. Only 53% of under-25s knew their HIV status at baseline compared to 72% of the older age group, and after two years 90% of under-25s knew their status compared to 98% of the older age group. Treatment initiation (89% vs 94%) and viral suppression (83% vs 90%) remained lower after two years in under-25s, and this difference translated into an overall level of viral suppression among the under-25 population of 67%, compared to 84% in the older age group. The investigators conclude that use of a multi-disease community-based approach with streamlined patient care, increased the proportion of all HIV-positive people with viral suppression from 45% at baseline to 81% within two years, thus exceeding UNAIDS 90-90-90 targets. Asked what elements of the intervention appear to have the greatest impact in achieving the overall goal of viral suppression, Maya Petersen told aidsmap.com that the team believed that it was the strong community involvement and patient-centred nature of the care provided, rather than any individual element, that had produced the high levels of linkage to care, treatment initiation and viral suppression. “This is a truly a community-based study; the idea to include non-communicable disease screening integrated with HIV care came from the community, and it also serves to reduce stigma,” she said. Study investigators characterise the model of care being offered as “walking with the patient every step of the way along their journey”, and say that practices such as flexible clinic hours have contributed to the high level of engagement seen in the study. The scale of the study – nearly 78,000 people – and the range of communities involved in two countries make the results of the SEARCH study among the most significant contributions to the emerging body of evidence supporting the implementation of `test and treat` programmes in lower-income settings. Results showing the effect of the intervention on the study’s primary outcome, HIV incidence, are due in 2017. Petersen M et al. SEARCH test and treat study in Uganda and Kenya exceeds the UNAIDS 90-90-90 cascade target by achieving 81% population-level viral suppression after 2 years. 21st International AIDS Conference, Durban, abstract WEAC0106LB, 2016.